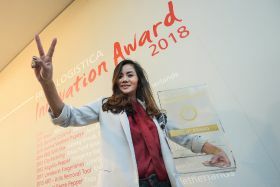 The Fruit Logistica Innovation Award (FLIA), the prestigious prize handed out annually at the Berlin event, is now taking applications for the 2019 edition. The award enjoys enormous interest from all international media during the three-day event, with previous winners and nominees describing the platform offered as 'the best stage you could wish for' to highlight new and unique products or services to the global fresh produce industry. Exhibitors who have a genuine innovation in their portfolio are being encouraged to enter the race for the FLIA 2019. The ten final, nominated products presented in Berlin enjoy plenty of attention, with thousands of reports in print, radio, TV and online worldwide. The FLIA has earned itself an enormous international reputation. It is regarded as the most important award in the global fruit and vegetable industry and enjoys a high reputation among experts, including those making up the judging panel. It only takes a few minutes to fill in the forms and put through an application for your innovative product. Applications are open to all exhibitors at Fruit Logistica 2019 who brought an extraordinary innovation to market between 1 November 2017 and 31 October 2018. The application deadline for the FLIA is Friday 9 November 2018. An application form and detailed conditions for participation are available as a PDF file on the Fruit Logistica website. This so-called 'Industry Oscar' is awarded by Messe Berlin and Fruchthandel Magazin (Düsseldorf) for outstanding innovations in the fruit and vegetable sector and its service industries. This award honours new products or services that have given the industry a tangible boost. A jury of experts nominates the ten most important innovations of the year for the Fruit Logistica Innovation Award 2019. These ten innovations will be presented in a separate exhibition area at the event. The more than 78,000 expected trade visitors will have the opportunity to vote for the innovation of the year during the first two days of the fair, with the winner officially honoured at an award ceremony on 8 February 2019.